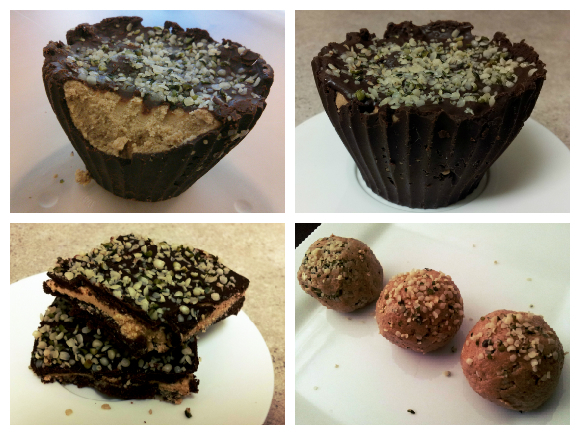 I created this recipe for my little sister, Katie, and her love for peanut butter cups! These peanut butter cups make an irresistible treat that contains healthy fat and lots of protein. It's great for people who are bulking and need to get in extra calories. It also works really well as a convenient snack to bring on long hikes or trips. Or, if you just want a healthier alternative to a traditional peanut butter cup, you can make these treats in any size you want. I never measure ingredients when I make these, so the below list contains estimates. You can't really go wrong with this recipe, and you can alter it to your preference as you go. The base filling can be used in many different ways, as shown by the picture. Microwave the chocolate chips with a splash of milk, stirring very often so that you do not burn the chocolate. You want the chocolate to be a pliable texture so that you can use your hands to mould it to a silicone container. Once you have moulded the chocolate to the bottom and sides of the container you chose, put it in the freezer to set while you make the peanut butter filling. Save some of the chocolate for the top of the peanut butter cup. 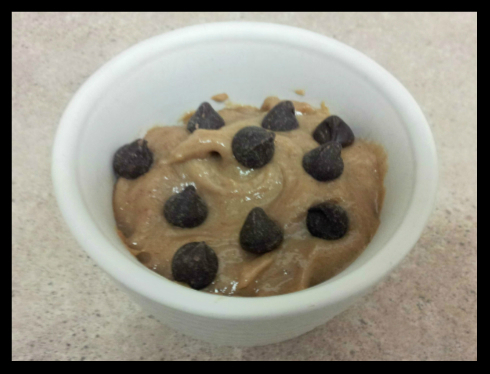 In a large bowl, mix together the peanut butter and chocolate protein powder. You can melt the peanut butter in the microwave if you wish, which will make it easier to mix. You can add more or less protein powder to get the ratio you prefer. The mixture will be too crumbly if you add too much protein powder. To keep the texture soft, add in the protein powder slowly. Next, add in honey to your taste preference. Squish the filing into the chocolate cup, and then add more chocolate to make the top. Sprinkle the top with sea salt and/or hemp seed hearts, and place back in the freezer to set. Once the cups have set, you can peel off the silicone cup. This recipe makes approximately 4 large cups. Store the peanut butter cups in the freezer or fridge. This is the approximate nutrition information for the filling. It does not include the chocolate coating. 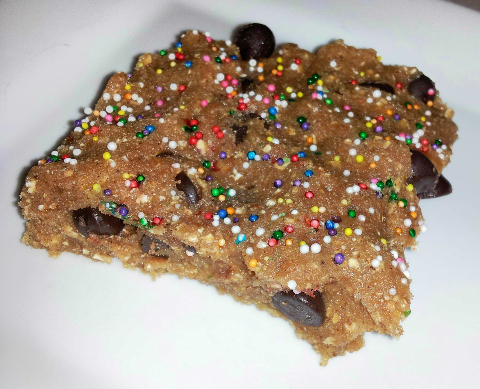 This cookie dough makes a delicious, quick, and healthy snack. 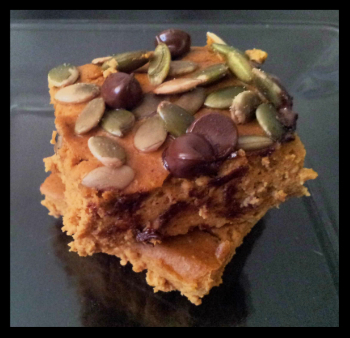 It's a great way to get in extra protein and really hits the spot when you want something gooey and sweet. Chickpeas are amazing! Cookie dough is my classic flavour, but you can also change around this basic recipe to make other variations. Mix all the ingredients (except the chocolate chips) together in a high speed blender until very smooth. Only use as much almond milk as you need for the blender to run, in order to keep the dough thick. When smooth, add in the chocolate chips and mix by hand. Enjoy this cookie dough on it's own, as a dip, cooked into brownies/squares/cookies, as an icing, or heated up in the microwave. Here's my own signature chilli recipe! It's a great hearty meal packed with vegetables and protein, and so much flavour. My husband and I have perfected this recipe over the years by experimenting with combinations. 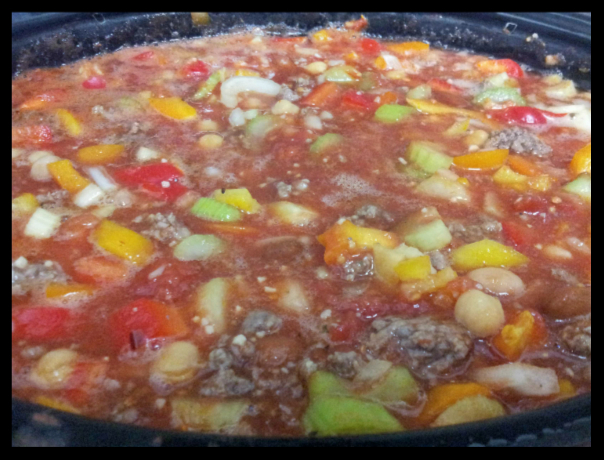 We learned how to make chilli from our parents and then created our own version through experimenting with flavours. You can make this in a crock pot or on the stove in a large pot. Mix up the vegetables and spices for your own spin if you would like! Chop up all the vegetables. Drain and rinse the beans. Cook the ground beef with some garlic and pepper. You can add as much ground beef as you would like. Either store these ingredients in the fridge for easy prep in the morning, or toss them right into your crock pot. Put the tomatoes with their juice in the pot, and the tomato sauce. Add all the spices, and give the pot a stir. Set the crock pot on high for about 5 hours or on low for about 8 hours if you want to have it cook while you are at work. If you are cooking on the stove, set the heat to low-medium and keep an eye on it. It will need to cook for a few hours. Stir the pot periodically. Basically, just throw all of the ingredients below into a pot and cook. Here's a healthy spin on traditional gingerbread cake. You can enjoy the warm spices of the season without having to ruin your healthy eating plans. Bring this cake to your holiday party to surprise your friends and family. They will not believe that something this tasty contains no flour, sugar, questionable ingredients, and is only around 50 calories a serving! Preheat the oven to 350 degrees. Put all the ingredients (except the pumpkin seeds and chocolate chips) into a high speed blender and mix until smooth. Pour into a pan that is lightly greased with coconut oil. Sprinkle chocolate chips and/or pumpkin seeds on top if you wish. Place in a large rectangular pan that is lightly greased with coconut oil. Bake for about 25 minutes. Bake longer if you want a firmer cake, and shorter for an even creamier, softer cake. For a softer cake, take it out of the oven when only the edges of the cake are starting to firm and crack, and the middle is still pudding-like. Store in the fridge. Enjoy this cake cold, room temperature, or heated up.